Art Deco Danish silver plate ATLA Cohr Silver Shell cutlery setting c1930 #2 for 6 people. This beautiful setting is in very good condition. The pieces are marked to the backs ATLA for the trade mark for Cohr Silver Denmark. 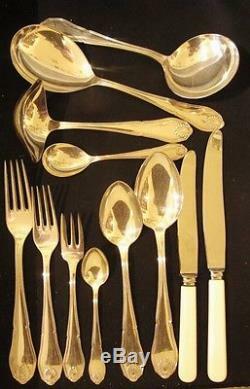 This is a quality set by a highly regarded silver workshop in Denmark. I have not been able to identify the pattern, although I have spent quite a time scrolling through Danish sites. The handle has a double line to the edge with a gently shaped design with a shell to the finial. This is a six person setting comprising 6 faux handled dinner knives, 6 faux handled entree knives, 6 large dinner forks, 6 entrée forks, 6 large Continental soup spoons, 6 dessert spoons, 6 teaspoons, 6 cake forks, a large serving spoon, a large gravy ladle, a large round bowl serving spoon and jam spoon. The knives are a set added by us and made by Grosvenor. The silver plating is bright and shiny. There are fine scratches from use, more to the 2 large serving spoons than any other pieces but as can be seen this is still minor. There is no silver plate loss. There is no spotting lifting or bubbling to the plating. It is a beautiful and elegant set. I have another matching setting for 6 available in a separate listing. For Imperial measurement users a handy guide is 25mm or 2.5cm is a little less than 1 inch, so 100mm or 10cm is just less than 4 inches. Please note this item is original and not a copy or modern day reproduction. We do not mark merchandise values below value or mark items as "gifts" - US and International government regulations prohibit such behaviour. The item "Art Deco Danish Cohr Silver Plate Shell 6 person cutlery set c1930 #2 52pieces" is in sale since Friday, April 28, 2017. This item is in the category "Antiques\Silver\Silverplate". The seller is "*emprades*" and is located in Kangarilla, SA.